Your Dentist in Fort Worth: Don’t Ignore These Oral Health Symptoms! “It’s nothing” you tell yourself as you walk out the door to your job in Fort Worth. As you pull on to the highway, the pain in your mouth doesn’t subside. By the time you make it to your office you can’t stop thinking about it. Your concentration is suffering through the whole morning and when lunch comes around, every bite triggers a jolt of pain. “Just power through it” you think. Your dentist in Fort Worth says no oral symptom should ever be ignored. Take a moment to look over these common oral symptoms and why you should always take them seriously. Pain – from mild to severe, occasional to chronic, and sharp to aching, pain of any kind needs to be address early. It can indicate tooth decay, a root canal infection, an abscess, jaw infection, or even gum disease. Any pain that wasn’t a result of an external stimulus should be checked by your dentist. Sensitivity – If your teeth react to cold, hot, or acidic foods, it could indicate decay, exposed root surfaces from gum recession, a leaky filling, or gum disease. It can also occur while brushing, so mention this to your dentist to find out if it’s an underlying issue or if you just need to change your toothpaste. Bleeding – Bleeding from the gums is not considered normal, regardless of the amount of when it occurs. Typically, bleeding from the gums is an indicator of gum disease but it could also be an abscess. Swelling – Look for any lumps, bumps, ridges, and pimples in your oral cavity. This includes the lips, gums, or other areas of the face and mouth. Ulcerations or Discolorations – If redness or sore spots on the lips, tongue, inside the mouth, face, or neck doesn’t resolve itself within 10-14 days, see your dentist for a professional examination. Loss of Feeling – If you lose feeling in areas of your mouth or face, it could indicate nerve damage. This should be looked at by your dentist immediately. 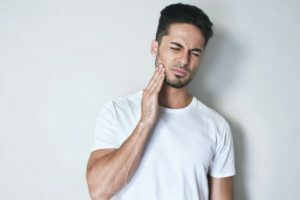 Persistent Coughing/Difficulty Swallowing – Pursue your dentist or health practitioner as these symptoms may indicate a more serious issue outside of dental health. Seek a doctor if these symptoms persist for more than a week. Many dental emergencies have occurred simply because patients don’t think there’s an issue if there are no observable symptoms. However, in cases like tooth decay, it can take long periods of time for it to progress through other areas of the mouth. The same is possible for gum disease, infected root canals, and abscesses. Relying on only noticeable symptoms of oral health issues will only put you at greater risk in the future. Therefore, regular dental visits are key to catching them early. Regardless of peoples’ excuses to put off their dental visit, the longer they do so, the greater their risk is of having to pay more for treatment. Since there is such a strong connection between oral health and overall health, it could mean medical expenses you never expected in the first place! Your Fort Worth dentist believes an ounce of prevention is worth a pound of cure, so start preventing by keeping a strict oral regimen and scheduling your next dental appointment today! Dr. John G. Boyd, D.D.S. is graduate and teaching advisor at the world-renowned L.D. Pankey Institute. With his expertise, he’s built a dental team whose combined training and experience set them apart from other practices. To contact him, visit his website or call him at (817) 882-8282. Comments Off on Your Dentist in Fort Worth: Don’t Ignore These Oral Health Symptoms!